One of the newest options for wagering on sports is to use online USA sportsbooks with live in-game betting. This is a technologically revolutionary option that betting sites have branched into, and it’s one that has become extremely popular with bettors in a very short amount of time. Live betting, aka in-game wagering, is the most interactive type of betting one can get into, as it gives users the ability to place live wagers as the game goes on in real-time. It's definitely taken betting on your favorite games and players to the next level. Want to learn more about live betting? This page answers many of the most commonly asked questions about in-game wagering on sports. Here, we’ll cover which sportsbooks offer live betting, and we’ll discuss exactly how live betting works. After this short primer, you’ll know exactly where to go for and how to participate in live betting on all the major sports you love. What Is "Live" Sports Betting? Think of your traditional sports betting and how that process is conducted. A betting line will be formed, and there will be a timeframe before that wager is taken down, for which you will have had to place your bet by that time for it to count. Usually, bookmakers will take a line down shortly before the start of the game. Once the game is action, the betting window closes in traditional sports betting. With live betting, this is no longer the case. Sure, the official game lines released by online sportsbooks will field wagers up until the start of the game, but then this is where live wagering comes into play. Live betting gives bettors the chance to get in on the action as the game is happening. A variety of odds could be formed during live betting. It depends on what game, which sports, and the players who are involved. Live betting is much more fast-paced than traditional betting as well, as you can place as many wagers as you want throughout the game. This type of wagering certainly generates plenty of excitement. More online sportsbooks than ever before have the option to bet live, but there are some that stand out in what they offer above the rest. Check out some of the best online sportsbooks that feature live betting that we have reviewed below. We selected these because we actually use them and know exactly what is in store for live sports bettors. If you want the smoothest, easiest-to-understand live betting experience, Bovada should be your first choice. This site is available to residents of all states except DE, MD, NJ, and NV, and you can place in-game bets on just about any contest offered, from mainstream US leagues (NFL, MLB, NBA, NHL, NCAA, etc.) to international league cricket, soccer, rugby, and more. Bovada’s live betting menu is basically as robust as their standard wagering menus, but because the site is totally optimized to make finding and placing your wagers easier than ever, it’s actually a breeze to get your bets in the second you see them. A lot of top-level books could take a lesson from Bovada, as the site’s design is the gold-standard for making in-game betting both fun and profitable. 5Dimes has long been bettors’ favorite destination for alternate lines and wacky props, but these are all traditional, pre-game wager types. You’ll be glad to know that 5Dimes does in-game betting just as well, with a live mobile and desktop sportsbook menu that updates in real-time, giving you dynamic odds on all your favorite matchups, all game long. For new users, 5Dimes offers a welcome bonus to use at their sportsbook, and it’s worth up to $520. You can use this perk to wager on traditional pre-game bets or live wager options, and its especially easy to meet the low rollover requirements when you enjoy the latter, given the sheer number of wagers on offer at 5Dimes. And of course, at 5Dimes, you will always get the site’s exclusive Reduced Juice odds when participating in live betting, boosting your winning potential dramatically. SportsBetting Sportsbook - Risk-Free Live Prop Bet! SportsBetting has some of the most varied odds boards and deposit options of any sports wagering site, making it perfect for beginners and veterans alike. With millions of US members, SportsBetting has a something for everyone, and when it comes to live wagering on all the major US and global sports, you can expect a whole lot more of the same high-quality product. At SportsBetting, live wagering is available, and you can easily navigate to the real-time odds boards for in-progress games by clicking or tapping on “Live Betting” atop the main nav bar under the site’s banner. This portal – which is accessible via desktop and mobile – shows all of the current live games of the day, and it updates automatically every time the site’s sophisticated algorithm refreshes the odds. New members can get a risk-free $25 player prop bet. Just place your wager, and if you lose, email customer service, who will apply a $25 credit to your account, no questions asked. MyBookie Sportsbook - Live Lines On All US Sports! 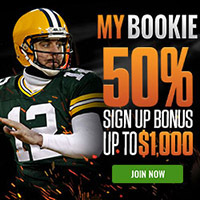 MyBookie is a relatively new but exceptionally value-filled sportsbook. While you’ll only get US lines at MyBookie (as they do not yet offer popular international odds), that’s perfect for well over 90% of US sports bettors. Plus, this refined and focused dedication to domestic Americana is a welcome change, as it allows the book to promote and offer the best values – and the best bonuses – for US bettors. In addition to all that, of course, MyBookie has live betting for those looking to capitalize on the in-game wagering movement. Live, in-game betting is a blast at MyBookie, with an easy-to-browse, auto-refreshing menu of dynamic daily odds posted front and center every time you log in. Additionally, the site offers several valuable bonuses, like its 50% welcome bonus which gives you up to $1000 in free-plays (10X rollover, promo code MYB50) and a $25 risk-free bet for first-time players, which, like the welcome bonus, can also be used for live wagering. We get asked about the difference between live sports betting and in-play betting all the time, and the answer is “not much”. Really, it all comes down to what types of odds you are able to wager on; live betting features adjusted game lines and prop bets, whereas in-play betting only covers adjusted game lines like the adjusted spread, moneyline, or game total (over/under). Outside of that, the only other difference is when betting odds are actually available. Live betting features props that run throughout the entire length of the game and then adds adjusted game lines during breaks, which can be as brief as 20-30-second timeouts and commercial breaks. On the other hand, in-play betting needs a longer break in the action to get the odds posted. Live betting is simply a matter of convenience when betting adjusted game lines, bit it’s a necessity if you want to bet on dynamic props. Most sportsbooks that offer live betting these days use sophisticated algorithms to automatically generate these shifting numbers in real time, which means that you now get more betting chances than ever. Most every sport will be available at one time or another at these online sportsbooks for live betting. The most popular sports in the U.S., such as NFL and college football, NBA and college basketball, NHL hockey, MLB baseball, PGA golf, tennis matches, UFC fights, European football matches, and more will have live wagers formed as they are played. When you visit any of the best bookmakers that have live betting, you will be able to view which sports are available at the time with live bets to be made, as well as check out which games are coming up on the live wagering schedule. Usually, current games with live betting will be published on the front page of the main betting menu for your convenience. Sportsbooks that accept Americans want to offer as many sports to bet live as they can, and this menu is always growing. What kind of bets can you make when wagering live at an online sportsbook? Typically, you will see that a lot of straight wagers are offered. This includes your most common wagers like point spreads and other game lines like moneylines or over/under totals. Also included under this umbrella are different game props, team props, and player props. The betting odds that you can find when betting live on a game will be numerous, and they will be continuously offered, changing dynamically throughout the duration of the game. Your wager could be finalized and graded instantly, or it might have to wait till the end of the game (like if you bet on an alternate point spread, for example).